This chapter was amended in June 2015 by updating a flow chart in Section 7, How do I Access the Services? Which Services are at Seaside View Child Development Centre? Which Services are not at Seaside View Child Development Centre? 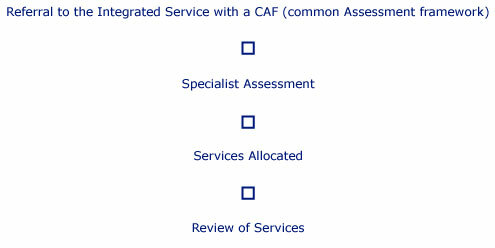 We are an Integrated Service within an Integrated Management Structure. To be eligible for this service there will be concerns regarding your child's development or they will have complex medical needs. The Service is for any child from 0 -18/19. Normally you will come in to the service having already had a Strengthening Families Assessment of your family's needs undertaken by a professional who knows you and has agreed with you that some more specialised assistance may be needed. This assessment is called an Early Help Family assessment. 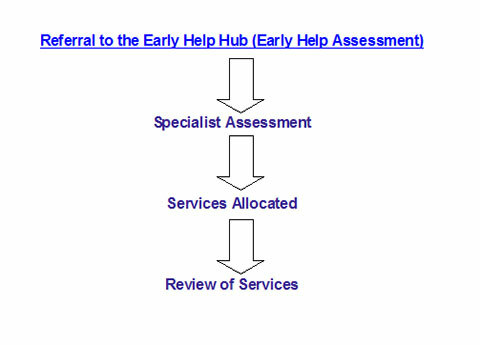 This is an assessment tool that all Children's Services are planning to use. The Integrated Child Development Service is at the Seaside View Child Development Centre based at the Brighton General Hospital. This document is intended to provide a guide for parents, carers, service users and professionals outlining how we provide services. The aim of our assessments is to be holistic and to provide an overview of all of the family's needs with a particular focus on the needs of any child in the family who have developmental delay and or complex medical needs. Not all the needs we identify will be met within the Child Development and Disability Service as we are committed to ensuring that wherever possible disabled children's needs are met by mainstream services in mainstream settings. Part of our role will be to liaise with professionals in the wider community, area teams and those based in the Children's hospital. 3. What is Our Philosophy? We are committed to working in partnership with parents /carers and children and young people. We aim to provide assessments and support that take in to account all aspects of a child's life including the needs of their carers and the whole family. We also aim to offer help and support at the earliest opportunity to prevent later difficulties. We know that supporting parents and carers is vital and we are committed to empowering you to be as resourceful and resilient as possible. We have a commitment to involving service users in the running of our centre and will provide regular consultation opportunities. 4. Where is the Service Based? The service is primarily based at Seaside View Child Development Centre located at the Brighton General Hospital, however, some areas of service remain located in other parts of Brighton and Hove. 5. 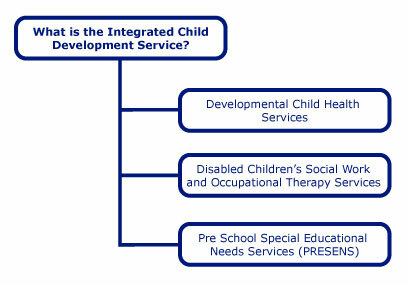 Which Services are at Seaside View Child Development Centre? All the developmental child health services are at the Seaside View Child Development Centre. These include specialist community paediatricians, health visitors, OT's, physiotherapists, Speech and Language Therapists, play workers, nursery workers, occupational therapists. In addition all of social care staff will be based in the same centre. 6. Which Services are not at Seaside View Child Development Centre? The Pre School Educational Services (PRESENS) are based at the Jean Saunders Centre. Other Services, for example the social care Outreach Team, Cherish, Portage, Barnardos and Residential Services are based in Hove. Although these services are not physically based at Seaside View Child Development Centre they are all part of the Integrated Child Development Service. 7. How Do I Access the Services? Normally you will have raised your concerns with a professional who will complete an assessment with you and your family which is the Early Help Family assessment. This will be passed on to the Integrated Service where you then will receive a more specialised assessment depending on the needs that have been identified. Once this assessment has taken place we can work with you to identify the appropriate services.